Posted: Thu Jan 10, 2019 5:41 pm Post subject: Differences in MS carburetors?? I have what should be the original MS carb on my 51 8N and it has MS cast in the bowl and TSX33 stamped on it. I have an old carb from a friend's 8N and it has MS cast at the mounting flange and has a brass tag with TSX 241B 4-54 on it. What is any are the differences in these 2 carbs? I see on this site they list different kits. If I was going to rebuild mine are the kits on this site the ones to use? Posted: Thu Jan 10, 2019 7:24 pm Post subject: Re: Differences in MS carburetors?? 9/2/8N gas tractors used M/S carbs TSX-33,241,241A,241B and 241C carbs. most were improvements over the previous model, some like the 241C were less than suitable designs. Ford Tractor and M/S then decided that the TSX-241B was the best version and obsoleted all but the TSX-241B. All versions of the mentioned carbs should be rebuilt to TSX-241B specs so but the 241B kit. Differences were minor, mostly in the jets, biggest variant was the economizer jet at first it was too small then larger then none at all and finally going to the the TSX-241B setup. 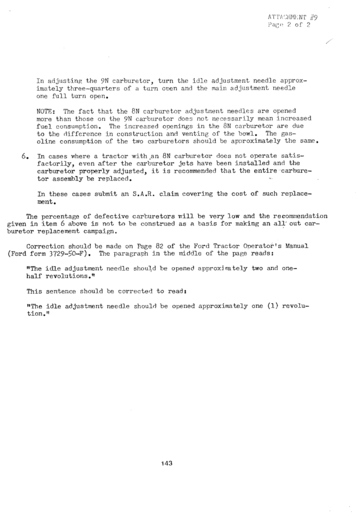 Posted: Thu Jan 10, 2019 9:45 pm Post subject: Re: Differences in MS carburetors?? OK, What is the difference or improvement from the TSX33 to the 241B? Is the TSX33 the original for my 51? I'm not worried for restoration reasons, just wondering. Also there are different kits listed for the TSX33 and the 241B so there must be a physical difference somewhere. All of that said should I just rebuild and use the 241B if it's a better design? Posted: Fri Jan 11, 2019 3:13 am Post subject: Re: Differences in MS carburetors?? 241B would be correct for your 8N. THe 33 will work in a pinch but the 241B is the best of the bunch. Posted: Fri Jan 11, 2019 4:32 am Post subject: Re: Differences in MS carburetors?? turn. And set the engine idle where you want it. Posted: Fri Jan 11, 2019 11:56 am Post subject: Re: Differences in MS carburetors?? What did the 33 come on? I get the idea that the 241B is better but I sure would like to know why. What makes it a better carb? These things are pretty primitive as far as carbs go so I wanted to know what is the difference. I'll build the 241B then swap it to my tractor since my 33 is working fine. 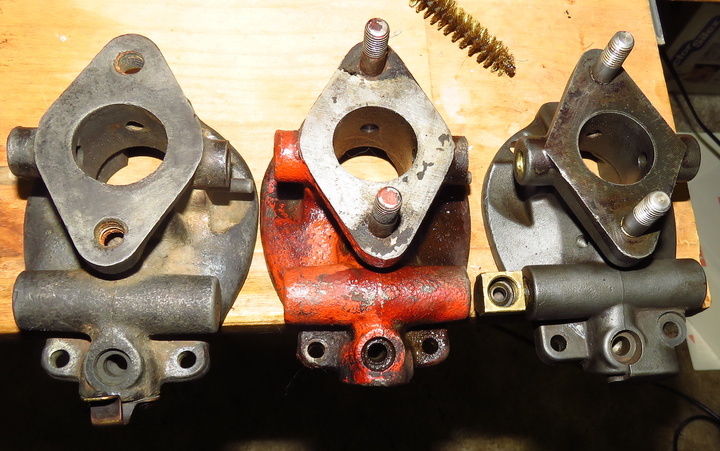 Posted: Fri Jan 11, 2019 12:21 pm Post subject: Re: Differences in MS carburetors?? Already mentioned that the economizers were the big problem with the early 33's. Initially they were way to small, the idle and power needles changed, some castings changed and so far as the TSX-241C is concerned to was a cheap version of the B and again deleting the economizer. The TSX-241B was the happy combination of parts, most efficient and most trouble free. All carbs are suitable for use and if rebuilt with TSX-241B parts you can't beat any one of them. Posted: Sat Jan 12, 2019 11:59 am Post subject: Re: Differences in MS carburetors?? Marvel-Schebler supplied the carbs for Ford tractors. The TSX-33 was used from 1939 thru early 8N production. Then in 1948, they released the TSX-241 unit - a little bit better designed part with subsequent revisions at B,C, and D. The TSX-38 was the Industrial Unit, used mostly on warhorse 2Ns as it had the double throw choke lever. ALL units operate the same way, and will work just fine on N's. The TSX-241-B carb your buddy has will work fine. Get the complete carb kit -usually about 40-50 bucks. The low budget kits do not have very many useful parts in them. I do not know what they sell her -they sell parts from several different suppliers, don't rely on one brand, nor make any parts themselves, so that is your prerogative whom you buy from. I but my kits on-line, complete. If you want, send me your carb and I will rebuild it professionally, guaranteed to fire right up with little or no tweaking required. My email is open and do not toss out your TSX-33 unit. The 8N and later M/S Carbs used a brass ID tag riveted on the Ping-Pong paddle boss. It had the TSX Model number and a date code stamp of when the carb was manufactured. Your TSX-241-B is perfect for your '51 8N, and the date code is 4-54 -April,1954. That means nothing other than the mfg date. Marvel-Schebler was part of the Borg-Warner Corporation but M/S is no longer in business. It is still highly recommended that you rebuild their carbs before thinking of buying anything made new today. Most new stuff is junk -carbs, distributors, water pumps, generators, starters, et al. ALL of these parts were engineered to be rebuilt over and over again. If the OEM carb hasn't been mucked up by someone trying to drill or ream open any passages, or stripping out any fine threads, it will work fine once cleaned inside and out and rebuilt correctly. 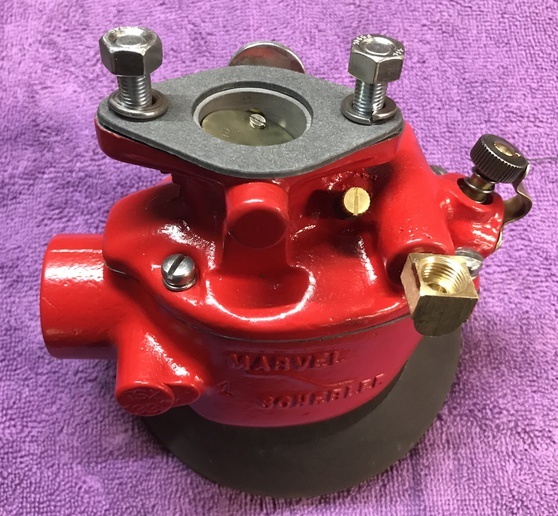 Posted: Sat Jan 12, 2019 5:39 pm Post subject: Re: Differences in MS carburetors?? "I get the idea that the 241B is better but I sure would like to know why. What makes it a better carb?" Nothing. That's an old wive's tale that gets repeated constantly. Make sure your TSX-33 has an economizer jet in it and run it. This kit on YT will get it done for ~$30 plus shipping. This one comes complete with butterflies, drain valve, elbow screen and screws for $55. I have used both with good results. Note that they fit 241 A/B/C. I've never seen any documentation on a 241D. As far as I can tell, there are two main aftermarket suppliers. Tisco and A&I. Pick your poison. I have not had much luck with A&I. If you'd like help doing the rebuild yourself, my email is open. This is one of the many TSX-33's I've rebuilt. Posted: Sat Jan 12, 2019 6:11 pm Post subject: Re: Differences in MS carburetors?? Interesting on the complete kits the 33 is a separate kit from the 241B but the comprehensive kit covers both carbs. First I have no intention of using an aftermarket carb when I have 2 originals. For whatever reasons it looks like the 33 wasn't the factory carb for my tractor. It performs fine though. Seems odd though as most everything else was untouched and I've had it over 30 years. I know somewhere along the line I've had it apart for a cleaning but that was 25 years ago. I have a few projects going on right now and the N is running good. Rebuilding the carb will happen, just a little later. I've done a lot of carbs but mostly auto and motorcycle carbs. cast iron carbs aren't common on cars, but I have done a brass Linkert from my Harley. Posted: Sat Jan 12, 2019 7:02 pm Post subject: Re: Differences in MS carburetors?? locate it quickly, so I had to use the "phone a friend" option. and 1/2 turn out on the idle air adjuster. specific order? It was recommended on many car carbs too. If these aren't clear enough to read, I can email them to you. Posted: Sat Jan 12, 2019 7:24 pm Post subject: Re: Differences in MS carburetors?? I tell people to save these to their files, and print them out. Makes the doc. very readable!!! Posted: Sat Jan 12, 2019 7:33 pm Post subject: Re: Differences in MS carburetors?? specific order? It was recommended on many car carbs too. " 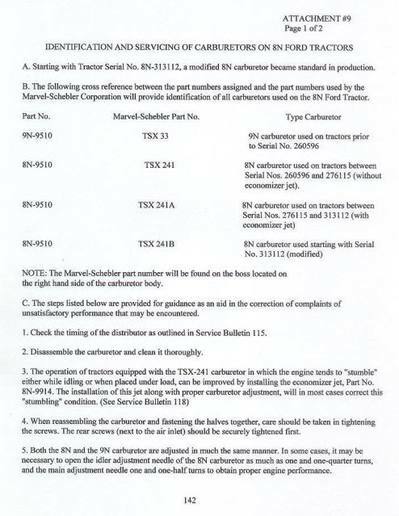 All I see in my M/S section is " tighten screws gradually until all are tight"
Posted: Sat Jan 12, 2019 7:41 pm Post subject: Re: Differences in MS carburetors?? Hopefully, we all learn something new every day! 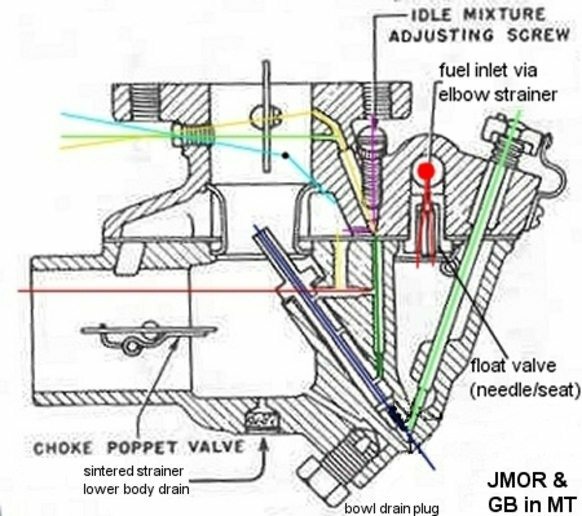 Posted: Sat Jan 12, 2019 8:02 pm Post subject: Re: Differences in MS carburetors? ?